I used to make pesto with my food processor. I just had to blend all ingredients and there you have – a quick and easy sauce. Little did I know that using a mortar and pestle would change the taste of this ancient recipe. Indeed, pesto dates back to the mid 800’s and – of course – Ligurian cooks did not have any electrical appliances back then. Pesto comes from the Italian verb “pestare”, which means to crush / to grind; so when making pesto, the use of a marble mortar and a wooden pestle is essential to get good results. The process of grinding using downward pressure and a circular motion is the best way to release natural oils in herbs, as well as to extract all the aromas and flavors from nuts and spices. In Italy there are different kinds of pesto (pesto alla Siciliana , pesto alla Trapanese, etc. ),but the most popular pesto is Pesto alla Genovese (the recipe comes from Genova, the capital city of the Liguria Region). 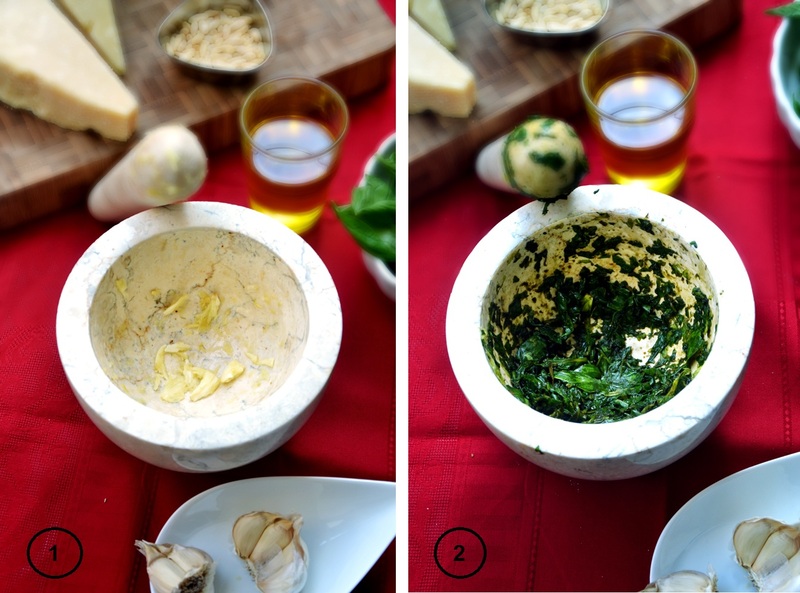 Since there are many versions of this sauce, I browsed through the sites of the Italian region of Liguria, and I came across the official site of the Consorzio del Pesto Genovese, an association engaged in the protection of the traditional pesto recipe. Therefore, after finding the best source I could ever hope for, I wanted to share with you the secrets of making Pesto as Ligurians do. Sticking to the traditional version is time consuming and it takes patience, but if you have a passion for food, making pesto the old way won’t be an unpleasant task!!! Wash basil leaves in cold water and pat dry. The smaller and younger the leaves, the more aromatic the pesto will be. Meanwhile, using a mortar and pestle crush 2 garlic cloves. The rule is to crush 1 garlic clove per 30 basil leaves. Add little by little the basil leaves crushing them using a light and steady circular motion while adding some coarse salt (be careful when adding salt since cheese is already salty!). When basil leaves produce a bright green liquid, add pine nuts. Pine nuts have essential oils that will soften and will amalgamate the sauce. Add extra virgin olive oil little by little and blend. A suggestion: use pesto as soon as it is done for a better and fresher taste. If you want to conserve it (and since pesto is prepared “ a freddo”, which means at room temperature), the best way is to omit oil and keep it as a paste and freeze it. 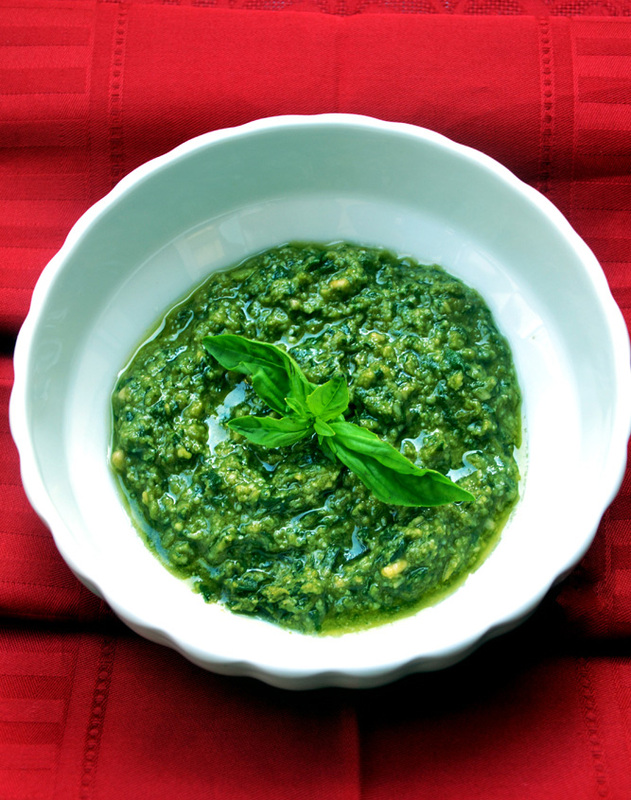 When ready to prepare pesto, unfreeze the quantity of paste you want to use and blend it with oil before serving. I’m delighted to have read this post. I’m so lazy with my pestle and mortar, so this has made me determined to make more use of it, particularly with basil being so readily available at the moment. The main picture looks glorious and you’ve done a great job with the step by step pictures. Thank you Roger!! The glorious picture as you said screams Viva l’Italia!!! I did have a pestle and mortar until about a week ago when I had one of my days when everything I touched crashed to the floor, hit the tiles and broke 😦 I agree, it does make a huge difference to the taste and yours looks so beautiful! So true and this is the time of year to profit from it! Beautiful. My mortar and pestle are both wood and very old. I do enjoy using them. Thank you Karen! I used to use my mom’s wooden mortar and pestle when I was back home. After this post, my sister is claiming it! Firstly your photos are fabulous! Secondly your timing couldn’t be better – I have to pick the basil leaves before they get too big or go to flower! and you know I’ll fess up here and now and admit I’ve always used the food processor, I’ll have to try it with our pestle and mortar. Thank you!! Thank you Claire! We never use our mortar and pestle. But now I use it for making guacamole and crushing peppercorns. It also crushes nuts, and it even makes breadcrumbs! If you find it, you will not only be making pesto – I assure you!! Looks delicious, but I’d be interested in that homemade Garam Marsala as well! Oh Yes! Garam Masala with all those wonderful spices! I’m so happy you visited my blog…that brought me here. A glorious, colorful, delicious place. So happy to meet you…so happy to follow! Your blog is wonderful and your pictures are stunning! I am so glad you subscribed to mine! Thank you! I’ve just returned from a visit with my Zia and am trying to catch up with all of the posts I missed. This one is perfection! I must confess that I put my mortar and pestle away and use my processor when making pesto. You’re right, though, it is worth the extra effort to make pesto the “old” way. It’s time I find that mortar and pestle. Aww! Thanks John! Say hello to Zia! I think it,s time to take your mortar and pestle out from your cabinet and begin to “pestare”! I love pesto so much! It just goes with everything and never fails to wake up a simple dish. This looks like a fantastic recipe! 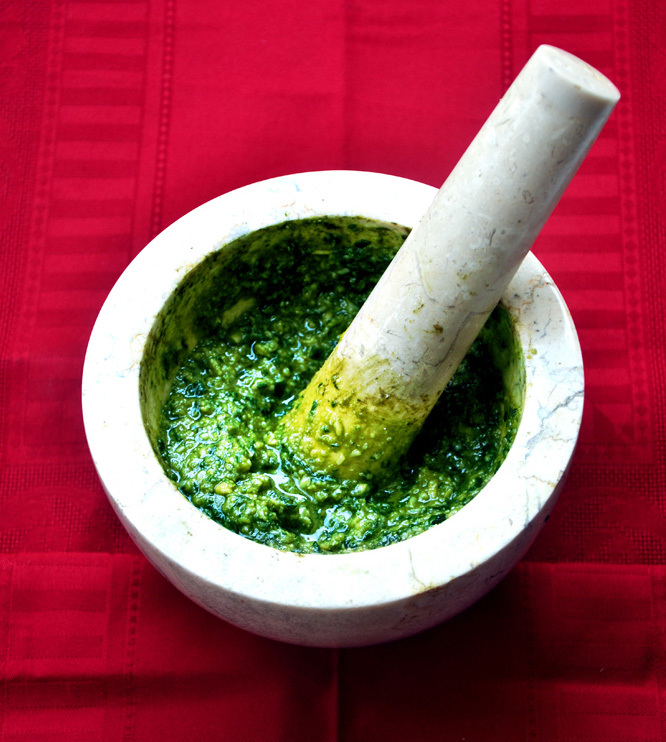 you specifically say to use marble and wood pestle and mortar, ive seen this before for pesto for the reason that it creates a lighter pesto than using a granite one. 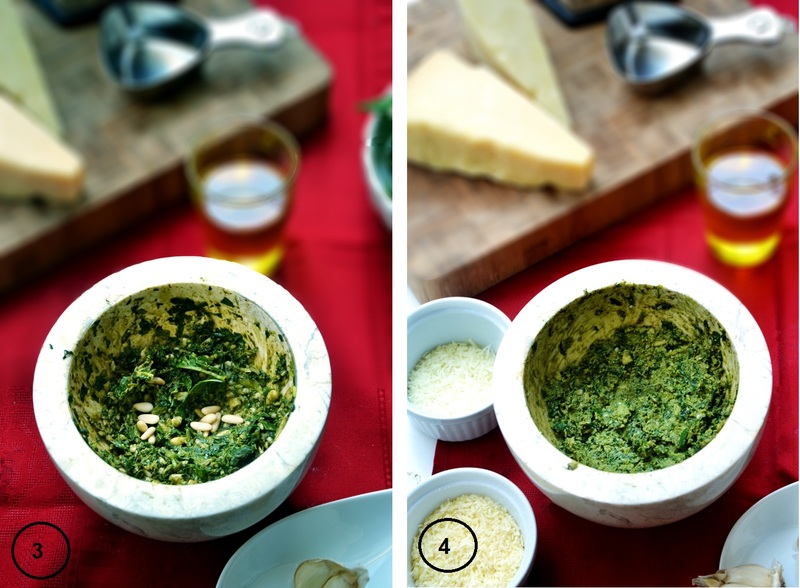 have you noticed a difference in the pesto when using either granite or wood pestle and mortars ? Hi! This is a good question! I have never made pesto with a granite mortar and pestle since I bought my first mortar and pestle -both made with marble. I guess the difference is consistency do to the fact that marble is a smoother material than granite. If you think about it, it makes sense. That is why the “optimal” way to make pesto is to use a wooden pestle that is not only porous but its smoother than marble. I guess that the pressing of wood against marble is gentler (than marble against marble) resuling indeed in a creamier sauce, with greater aromas and brigther colors. Thanks for stopping by!